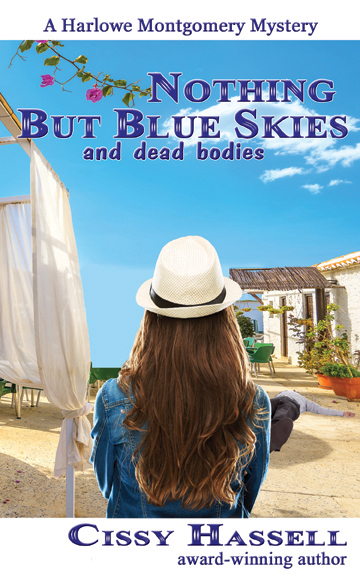 Wherever Harlowe Montgomery is, dead bodies follow. Two murders and a child kidnapping and with Detective Jake Diamond staring her down, her investigative skills are in question. Going on instinct alone and with the help of Gus and Chet, her loyal employees, and calling in favors of a childhood friend, she sets out on an adventure that takes her to a hired assassain and a Russian diplomat. A sudden turn of events stuns them all, when Harlowe becomes a victim of a kidnapping herself by one of the suspects she's investigating. She was told to come right home from Cynthia’s house. At eight years old, Tiffany Grennard felt she was responsible enough, to her way of thinking, to be out on her own. It was daylight. What could happen? Her parents worried too much about everything. She and Cynthia came here all the time. Sometimes, they even picked flowers. Well, not since that man said he would tell on them. She didn’t feel like going home. It was boring there. There was nothing to do. Nothing that was really interesting anyway. She wanted to do something exciting, have an adventure, find a unicorn, catch fireflies. They were real, weren’t they? She felt guilty about disobeying her mother, though. But when she came to the park and saw all the different colors of flowers, that guilt was completely forgotten. She bent over to smell a big yellow flower, knew she wasn’t supposed to pick it but she did anyway. It was pretty and she wanted it. There was no one watching so she was safe. There were rows and rows of beautiful colors. She skipped along the path and took them all in. There were red ones and purple ones. Big ones and little ones. Different shapes, short and tall. “Hello,” said a voice behind her. “I wouldn’t think of it,” he assured her. She skipped back out of the park, holding the flower tightly in her hand. She would put some water in a vase and put her treasure inside. She’d set it on her dresser where she could see it all the time. She hoped it would stay alive for a long time. It was then she noticed the man was walking with her, just a few steps behind her. She stopped and looked up at him and felt her first jab of fear. The man reached out his hand for her to take it. She stared at it then raised her gaze to his face. She wasn’t sure she liked the way he was looking at her. She forgot all the warnings her mother had told her. She turned quickly and hurried down the path, wanting to get home as fast as she could. But the man behind her clamped a hand on her shoulder. His grip hurt and she tried to cry out but her face was covered by a piece of cloth that smelled like cleaning fluid, she thought as her small child’s world titled crazily and all she could remember was falling headfirst into a deep dark pit. Copyright ©2004-2018. Cissy Hassell. All Rights Reserved.